I heard many people complaining about the hot weather over the last week or two but I loved every minute of it. OK, I found sleeping a bit of a challenge on some nights when the temperature in our bedroom hovered at the twenty five degree mark even with all the doors and windows open and maybe it was a little warm for work, but the evenings were heaven. Take last Monday evening for example: As usual I finished work at 5.30. By 5.35 I was back at the boat or, more accurately, by the side of the boat. Sally had two camp chairs set up in the shade of the cockspur thorn tree on the peninsula next to James. We enjoyed a salmon salad overlooking the marina island then rested for half an hour while I enjoyed my evening bottle of Theakston’s Old Peculiar. Then we went to collect our desert. We have dozens of wild cherry on the site. Unfortunately their brightly coloured fruit are small and bitter so they don’t make good eating. However, there are two exceptions. There’s a 20 year old cherry tree – don’t ask me what type – bowed under the weight of ripe black cherries. There’s another six year old tree which, for the first time this year, has produced a wonderful crop of fat juicy and very sweet red cherries. Within half and hour we collected at least 2KG of mixed red and black cherries, washed them, put a couple of handfuls for each of us in bowl and added a scoop of Tesco Finest vanilla ice cream. We took our freshly picked desert out to the shade of the cockspur thorn where we sat until dusk. You can keep your big houses, fancy cars and exotic foreign holidays. Give me a bowl of freshly picked fruit enjoyed in a stunning rural setting any day! Did you read this article in the Daily Mail last week? I don’t actually read the Daily Mail, or any other newspaper for that matter- they’re too depressing – but this particular article was brought to my attention because it paints a far too rosy and none too accurate picture of life on a narrowboat. Anyone who currently lives on board will notice the inaccuracies immediately. Probably the most glaring error is the claim that the owners don’t need to pay mooring fees or council tax because they are continuous cruisers. They aren’t. They’re moored in Stratford upon Avon where she works in a cafe and the kids go to school. They claim that they don’t need a mooring because they are continuous cruisers and move their boat every few days. A continuous cruiser has to be on a progressive journey. Clearly they aren’t if they have to be close to both work and to schools. They claim to have reduced their household expenses from £11,000 a year to £3,000. The waterways license and mooring fees, which so far they have avoided (but I suggest not for long once the Trust read this article) would total £3,000. Then there’s the cost of their heating. They claim that they spend just £60 each month on diesel for both their heating and propulsion. Given that they didn’t decide so sell up until February this year, they probably didn’t move onto their boat until April or May. They haven’t actually experienced any cold weather yet so probably haven’t needed the heating on very often. They’ll get a shock later on this year. There’s no mention of expenditure on gas so maybe they have an electric cooker which may well account for the high electricity cost and the need for a generator. They couldn’t run an electric cooker without one. There’s no mention of the cost of running the solid fuel stove (I spent nearly £900 last autumn, winter and spring) or repairs and maintenance. I don’t know how long they intend to stay on the boat or how often they are going to carry out essential maintenance such as blacking, painting and essential engine and equipment servicing but they need to budget for them. Another inaccuracy in the article about their life on a narrowboat is Mrs Lawrence’s claim that “It’s freezing in winter” How does she know? The article states that the final straw for them was in February this year when they were faced with huge fuel bills following a “harsh” winter. They probably didn’t move onto their boat until at least April so they haven’t experienced a winter on the boat yet. For starters, last winter wasn’t particularly cold. It dragged on a bit, but there weren’t that many really cold spells. 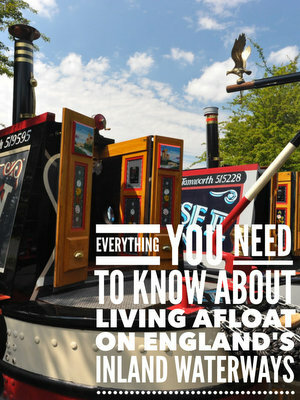 Secondly, life on a narrowboat doesn’t have to be uncomfortable. Admittedly my first winter, the winter of 2010/11, was decidedly chilly. It was the coldest December since records began in 1908. The marina was covered by five or six inches of ice for six weeks. We had a few consecutive days with highs of minus six and one night when the thermometer dropped to minus eighteen. That night the temperature in my bedroom was minus two. I woke the following morning to fine a quarter of an inch of frost on the cladding inside the engine room. That winter I was cold. I hadn’t yet over plated the perished wooden top with steel – and sandwiched another layer of insulation between the two. I often needed to wear an additional fleece top and a hat when I was sitting at my laptop in my office area towards the rear of the boat. And I was still cold. I was cold on my boat, but then so where thousands of other people in their bricks and mortar homes. The weather was as unusual as it was extreme. The following two winters weren’t a problem. I haven’t been cold at all and James isn’t really what you could call a warm boat. I know many boaters, with better insulation and heating systems than I have, who leave their front doors open in the winter to let some of the heat out. Russ, our fitter, says that he can remember many a winter when he had his boat sitting sweating in his underpants (not a pleasant thought) with the front doors wide open and snow thick on the ground outside. There really isn’t any need for this family to be cold in the winter. Maybe they’ve only used their central heating so far and not fired up the solid fuel stove as well. Anyway, the heating is the least of their problems. 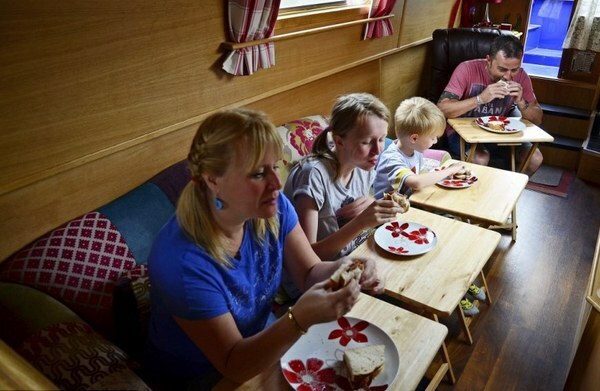 Not many families live on narrowboats. There just isn’t the room. Most liveaboard narrowboaters are either singles, mainly men but quite a few women too, and older couples. The few liveaboard children are mainly pre school. Teenagers need space. This family have a son and a daughter with bunks in the same “bedroom”. There’s very little space for clothes, toys and possessions, and absolutely no privacy. Twelve year old Phoebe will go through puberty with seven year old Jake for company. In five year’s time, Phoebe’s raging hormones will have Jake’s to contend with when he goes through the same changes. At the moment, the family has all the space they need. The days are both warm and long. They can spend as much time as they like outside, returning to the boat just to eat or to sleep. All too soon the nights will draw in, the thermometer will drop and long evenings on the boat, enjoyed by adults who can appreciate the simple pleasure of reading a book sitting by a living coal fire, will have to be endured by energetic children. Children can immerse themselves for hours or days in the virtual worlds available to them through their gaming consoles. However, and increasing number of these games rely on fast internet connectivity. Fast and internet aren’t two words you can often use together when you live on a boat. Very rarely is the boat’s internet connection fast. Sometimes there’s no connection at all. An alternative to gaming is watching the infinite number of television channels available to couch potatoes everywhere. Everywhere that is apart from on boats some or all 0f the time. I hope that this family make a go of it. I really do. But I don’t think they have either understood or budgeted for all of the costs involved in running and maintaining a narrowboat long term. They certainly haven’t understood the continuous cruising rules and the need to pay £2,000 – £3,000 for a residential mooring (if they can find one) so that they can stay close to work and to schools in Stratford. I don’t think that they have considered the implications of housing two increasingly volatile youngsters in a very small space with little or no privacy, no room for their material possessions or access to their digital worlds. There are very few older children living with parents on narrowboats for some very good reasons. In years to come, I hope Phoebe and Jake can remember predominantly happy memories from the latter part of their childhood spent on a narrowboat. Somehow I doubt it. There’s a thread on the forum dedicated to this article if you would like to offer your point of view. Everyone has their favourite boat builder. Mine is Steve Hudson. Some say he is too set in his ways, normally as a result of asking him to build a concept boat or to stray too far from his very successful formula. Steve Hudson builds traditional style narrowboats, usually with a boatman’s cabin, sometimes without, but always with a traditional stern. Every summer S. M. Hudson hold an open weekend at their Glascote Basin premises near Tamworth. They usually have three or four of boats on show at different stages of construction. They also have an army of evangelistic Hudson narrowboat owners showing off their own boats. Sally and I spent a very pleasant hour or two there last year looking at boats we couldn’t afford. We enjoyed the frustration so much we’re going again this afternoon. There was one 62′ bespoke liveaboard on show last year which we absolutely loved. The boat was typically Hudson; classic lines, a glistening engine visible through the side hatches,chunky and plentiful woodwork inside, acres of storage space and every convenience neccessary to make life on board a real pleasure. We very nearly paid Steve Hudson £500 there and then to reserve a build slot for our own bespoke liveaboard. There was just one small detail which encouraged me to leave my wallet in my pocket… We didn’t have the remaining £149,500 for the full price of the boat. Maybe next year, we said. Here we are. Next year is now this year. Sadly we’re not much closer to the total. We’ll carry on dreaming as we window shop this afternoon.